There’s a wealth of knowledge and life skills to be learned from participating in team sports. If we ensure that our kids have coaches who are good role models, and we take care to be good role models ourselves, our kids can only benefit. Unfortunately, that’s not always the case, and sometimes we’re doing more harm than good. The importance of teamwork, and the opportunity to actively practice working together with other kids. Regular exercise, and an emphasis on forming healthy habits that will last throughout their lives. The value of empathy toward the losing team. Good sportsmanship toward players on both teams, coaches and officiants. The experience of crushing defeat that comes from losing an important game, and how to handle that defeat appropriately. Physical skills such as large and small motor skills, balance, reaction speed, accuracy. Occasionally, parents just lose their minds once they get on a sports field. Some are so invested in living vicariously through their children, that every game seems much more important than it really is (trust me, a Little League game with six-year-olds is not going to make or break an MLB career). 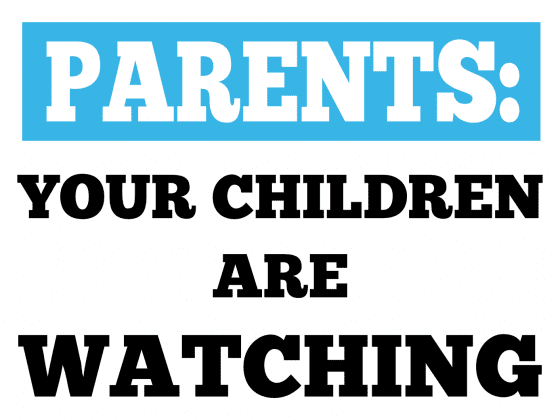 Other parents get a Papa or Mama Bear mentality while watching their kids play. Fouls happen during regular play of most games, and officiants can’t always see everything that happens on a large field. When a kid gets pushed by an opposing team member, some parents start yelling at the kid, the kid’s parents, the coach or the officiant. Or all four. It’s important to remember this: it’s just a game. If your kid is unfairly called out, or has a foul called on him, it’s not the end of the world. Sometimes when an opposing player commits a foul on your kid, it’s purely accidental. Other times, it’s due to the heat of the game and not intentional. Sometimes it IS intentional, and that’s not OK. But there’s an irony there if you react by screaming and swearing; you’re angry about bad sportsmanship and reacting by being… a bad sport. Your children learn most of their behaviors by watching yours; not necessarily by listening to you dispense parental wisdom. If you lecture them in the car all the way to the baseball game about being a good sport and not throwing tantrums if they strike out, but then scream at the umpire when he calls a ball a strike, your kid is going to remember your behavior… not your sage advice. Good coaches make great role models. They will certainly help to shape your child’s views of sportsmanship. But ultimately, you can’t expect to just fork over $40 to the rec league and magically get good sportsmanship from your kids. It doesn’t work that way; it’s not like buying your kid a new shirt. You don’t buy good sportsmanship; you guide your kids and help them develop it. Coaches are just one influence in your child’s life. As the parent, it’s your job to teach him the qualities you want him to have as a responsible adult. And, as we’ve already discussed, the best way to teach that is by example. The images in this post are all templates for signs that promote good sportsmanship. 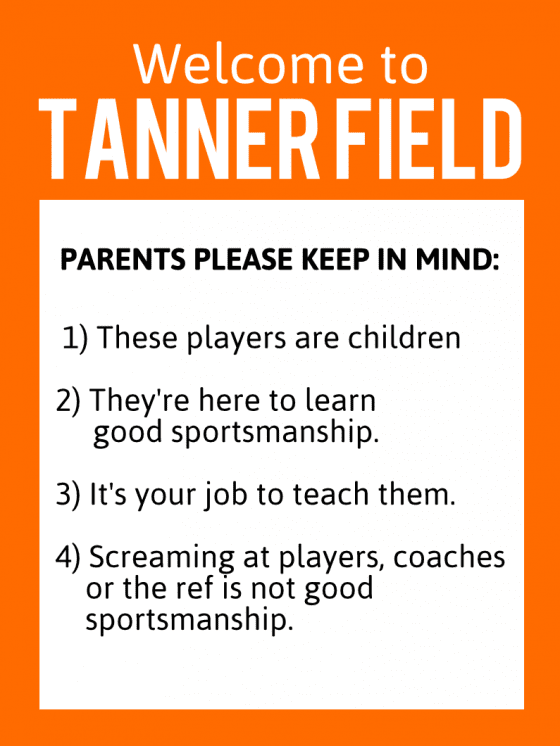 We’ve been seeing similar signs posted on sports fields all over, and we think they’re a great idea. Sports games can become really heated and emotions run high sometimes. As parents enter the field or arena, it’s good to have a reminder: Behave!